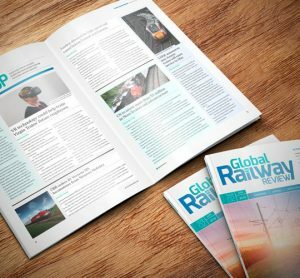 More traffic, increasing axle loads and higher speeds are just some of the ongoing technical and economic challenges railway operators and track managers around the world are faced with today. Under Sleeper Pads (USP) have been proven to extend the service life of the track superstructure and help to reduce Life Cycle Costs (LCC). Under Sleeper Pads (USP) represent a further development within the classic elastic components used in the construction of permanent ways. They are additionally installed on the bottom surface of the sleepers and increase the degree of vertical elasticity in the track superstructure. The objective is to transmit the loads from the vehicles via the rails, rail fasteners and the sleepers into the superstructure and the subgrade in the smoothest, safest and most well distributed manner possible. Due to the defined degree of elasticity, it is possible to reduce wear on the track system through lower dynamic forces, thereby improving the durability and cost-efficiency of the overall system. The aim of USP is to extend the service life of track superstructures. Moreover, they are installed to insolate vibrations, as a limited cost alternative to ballast mats. 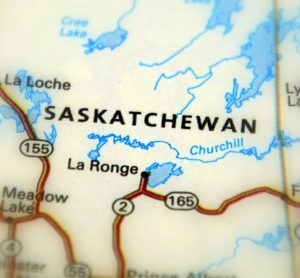 They have been in use since the mid-1980s, and are installed in regular mainline operation for train speeds of up to 300km/h. They are also increasingly being used in turnouts as well as to improve track geometry and lower vibrations. Ballasted track still continues to be the most commonly used form of construction for railway tracks. Due to the steady rise in axle loads and train speeds, however, operational loads are gradually increasing. As the weakest link in the traditional track superstructure, ballast is subjected to permanent dynamic settling. The loads transmitted by the sleepers are resulting in ballast deterioration, caused by abrasion and splintering, leading to breakage and disintegration of the single ballast grains. This damage to the ballast has a detrimental impact on the track geometry and quality. Figure 2 shows a sleeper with a USP type Sylomer® SLB 2210 G after 4.5 years in operation. This sleeper was installed in one of the most heavily used lines at Bad Krotzingen (Germany) and shows the indentations left by the ballast grain in the load areas after 190 million load tonnes. There are fewer indentations in the centre of the sleeper as the track is not tamped here. Despite the massive operational load, there was no perforation or other destruction of the elastic padding material. The indentations in the elastic layer, which are desired in order to ensure sufficient resistance against horizontal displacement (i.e. rail buckling), help to stabilise the top ballast layer. Dynamic loads are transferred into deeper areas of the ballast. At the same time, the larger contact surface area of the track frame in the contact zones results in more even settlement. 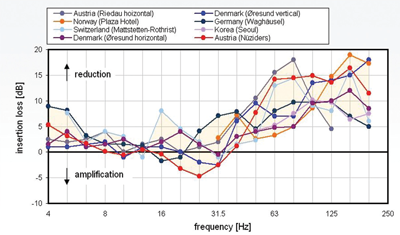 With the objective of measuring resistance to horizontal displacement of padded sleepers, several studies are currently underway in Germany, Austria and Switzerland. 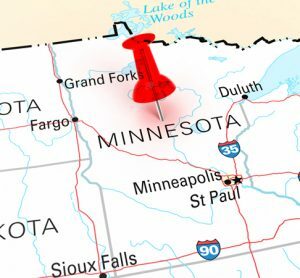 Due to the various methods of measurement, however, no well-defined results are available yet. While the assumption in Germany and Austria is that there is no reduction of resistance to horizontal displacement, in Switzerland a trend towards a reduction was found, but this seems to depend on the product used. In displacement measurements carried out by the University of Innsbruck on tight radius curves (R=230 to R=265 m)1 the average amounts of the horizontal track displacement were measured at various points based on five passes for each direction of travel. For one reference point, all displacements caused by the test locomotive returned to their original position, at a different measurement point a residual horizontal deformation of maximum 0.1mm was found. In the section where sleepers were fitted with relatively stiff pads, the residual displacement was up to 0.1mm and in a few cases up to 0.3mm. With extremely soft USP, residual deformations of up to 0.2mm were measured, in a few cases up to 0.6mm. Hence, the residual deformations immediately following the passage of the train were essentially negligible, compared to the measured maximum displacement of the track frame of up to 2.5mm. Fundamentally speaking, one can expect to find fewer outliers in the data with the use of USP and the fluctuations in the horizontal displacement resistance of individual sleepers are smaller. As a result, the track geometry in the horizontal plane is more homogeneous on the whole, which has a favourable impact on the stability of the continuous welded rail. The current trend for reducing wear on the ballast and adequately stabilising the track frame is to use somewhat stiffer pads (bedding modulus of C ≥ 0.2 N/mm³) with a large degree of plasticity. On the whole, an extension in service life of the entire system can be achieved due to the further development and optimisation of ballasted track using padded sleepers. USP made of Sylomer® have been tested and used by the major rail operators in Europe for over 15 years. These Polyurethane (PUR) elastomers are extremely resilient and exhibit very little dynamic stiffening. Along with improvement in the quality of the track geometry and track stability, one key insight gained from the long-term use is the possibility in reducing the height of the ballast bed. Figure 3 shows the initial positive experiences from measurements during the period 2001-2008 on a test track section in Markersdorf (Austria)2. The quality is represented by the averaged standard deviation of the longitudinal rail level. In locations where low construction height is expedient or necessary, for example in tunnels with low overhead clearance, or on bridges to reach sufficient bedding conditions, USP can have an additional financial impact and result in significant cost savings. With regard to wear and tear on the track system, the measurements carried out at the University of Innsbruck indicate that in tight radius curves the formation of rail corrugation can be retarded on the surface of the interior rail1. Rail corrugation occurs as a function of speed, radius and cant. The vertical stiffness of the track also influences the formation and development of such corrugation over time. Rail corrugation generally leads to increased dynamic loads on the superstructure, which can result in deterioration of the track geometry and destruction of the rail fasteners, the sleepers and the ballast. 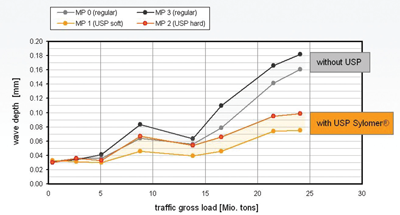 With USP, the average depth of the corrugation in the test curves increased less quickly than in the standard track superstructure and was approximately 50% less after a gross load of 25 million tonnes (see Figure 4). For sleepers equipped with USP, the average depth of the corrugation was 0.075 – 0.1mm and thus was considerably lower than the values for the unpadded sleepers exhibiting an average corrugation depth of 0.15 – 0.18mm. The average corrugation length was also shorter in the section with pads than at the reference measurement points. In some tight radius curves with padded sleepers, no rail corrugation has been detected, even after several years. Wear on the rail pads was also strongly minimised. In respect of track settlement, an improvement on the order of 40-70% can be achieved compared to conventional ballasted track systems3. Long-term experience shows that the use of padded sleepers significantly reduces maintenance expenses for the superstructure and increases the intervals between tamping. A significant reduction in vibrations is found especially for frequencies above 40 Hz. First of all, this has a beneficial effect on the stability of the ballast, because the ballast frame is sensitive mainly to medium-frequency vibrations in the range of 50-150 Hz, and consequently exhibits a stronger tendency to ‘liquefaction’ and thus become instable4. 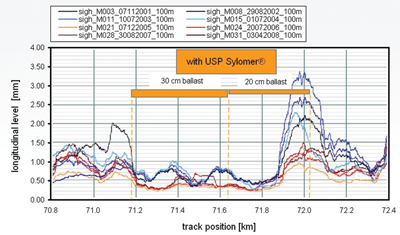 Tests in Germany have shown that the use of USP results in significantly improved vibration behaviour compared to traditional ballasted track5. With various test installations mainly in Europe, an insulation of between 8 to 15 dB was found in the relevant frequency range – concerning the insertion loss. The greater the elasticity of the material used and the lower the bedding modulus, the greater the insulating effect of mitigation against structure-borne noise. Due to the reduction of higher frequency vibrations and structure-borne noise in particular, elastic USP represent a cost-effective alternative to ballast mats, especially for situations without very stringent requirements. At the same time, it is also possible to compensate local inhomogeneities in the track without changing the sleeper design. Based on the experience gained so far, a significant advantage is generated using a simple, thoroughly tested system. Generally, no substantial changes are determined with regard to primary airborne noise. 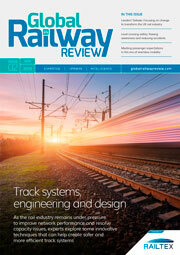 Based on the available measurement data from rail lines with padded sleepers, the Technical University of Graz has carried out various studies on the cost-efficiency of railway tracks. These studies were based on investigation of LCC aspects6. In order to do this, measurement data on track geometry quality was analysed over a period of eight years. It was found that the desired goal of maintenance planning, i.e. to reduce LCC for the track, can be achieved most effectively by extending the service life, with a corresponding reduction in depreciation. Use of sleepers with pads can extend the intervals between tamping by a minimum factor of 2 to 2.5. 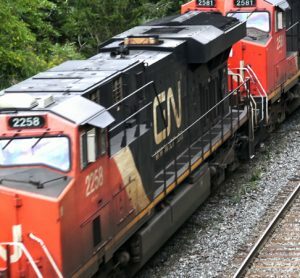 Even taking a conservative view this can at least double the service life of the ballast. It should be recalled that, depending on the quality of the stones used, ballasted track can usually be tamped about 10 times on an average. As a result, the service life of the track is highly dependent on the condition of the ballast. In determining cost-effectiveness, the costs stemming operational disruption due to maintenance work are also taken into account (e.g. track closures, zones of reduced speed). In this regard, it has been found that the higher the traffic loads and the more strongly a track section is used, particularly for tight curves, the more cost-effective USP are. At the present investment costs, the interest rate on the capital employed should be approximately 5% in order to be profitable. While padded sleepers initially are a cost-increasing factor, the technical and economic impacts demonstrated must be specifically considered. In addition to being a very economical and effective option to reduce maintenance costs, the basic aspect that should be taken into account in this regard is the extension of the useful life of the track. USP made out of PUR elastomers are available as standard products in tightly graduated levels of stiffness with bedding modulus ranging from C=0.02 N/mm³ to stiffer than C=0.30 N/mm³ (measured as per German railway standard DBS 918 145 – 017 on a norm-ballast-plate). Prior to installation, the elastic components must be bonded to the entire bottom surface of the concrete sleeper. On the one hand, bonding the pads helps to ensure safe transport and on the other hand, the pads must be tightly and strongly bonded to the sleeper during their service life. This is necessary in order for the pad to be able to transmit the longitudinal and lateral forces and to withstand tensile loads, for example when the track frame is lifted for maintenance work. In the past, USP were bonded to the sleepers following production using an adhesive. The current trend, however, is to integrate the pad into the production of the sleeper itself. A strong bonding layer is used for this purpose. One excellent way of ensuring this is the use of an assembling mesh incorporated into the sleeper whereas the upper half of the thickness of the mesh extends out of the pad, which then is pressed into the bottom of the sleeper. This method works with varying degrees of wetness of the concrete and it is not necessary to vibrate the mesh into the concrete, depending on the specific production process used. Basically, bonding of Sylomer® or Sylodyn® sleeper pads is possible with all types of production processes commonly used for the manufacturing of concrete sleepers, regardless of whether the principle of immediate demoulding or later demoulding is applied. Positive experiences have also been gained with self-compacting concrete. The very good mechanical bonding between the sleeper pad and the concrete has been demonstrated by pull-off tests in the laboratory. The average pull-off resistance of D σR=0,50 N/mm² 7 as required by the German railway standard is ensured by the use of above described assembling mesh. In order to increase the resilience against the contact of ballast grains and their sharp edges, it is also advantageous to install an additional load deflection and protective layer on particular highly elastic pads. A felt-like material (geo textile) has proven very effective in protecting the active elastic layer from damage caused by the track operation. Due to the strong mechanical adhesion between the elastic pad and the bottom of the concrete sleeper, standard installation procedure will be used for the padded sleepers and there are no restrictions on track maintenance. Transition zones in which the bedding modulus values of the subgrade beneath the sleepers change can be compensated by the use of USP with varying degrees of stiffness. It is also possible to even out the geometrically induced differences in stiffness within turnouts with their indifferent long sleepers. 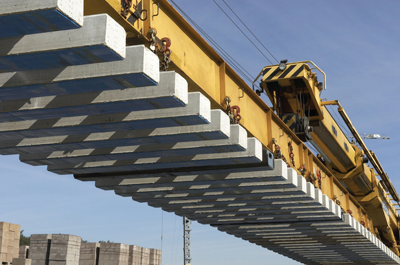 Pre-installation by the sleeper manufacturer ensures smooth progress at the construction site. No additional work is required at the track installation site. The installation of the sleepers is quick and unaffected by weather conditions (which could affect the adhesion), hindered in no way whatsoever by the use of USP. Increasing operational loads on railways require further development of the ballasted track system. The installation of precisely defined elastic components can help to meet the requirements such as satisfactory elastic behaviour for the prevention of track settlement, reduction of vibrations and structure-borne noise and lower track maintenance costs. In the future, increased use of Sylomer® and Sylodyn® sleeper pads promises an excellent cost-benefit relationship. Elastic pads help to mitigate the forces in the contact zone between the concrete sleeper and the ballast grains and at the same time protect the surrounding ballast from the impact of the strong dynamic forces. Consequently, the superstructure is subject to considerably lower forces than is the case with traditional concrete sleepers. Introduction of an elastic layer beneath the sleeper does not require any modification of the rail profile or special rail fastening systems which might be necessary when extremely soft rail pads or baseplate pads shall be used. Furthermore, the material and installation costs are far less compared to the installation of ballast mats. LCC studies confirm that the installation of track systems using padded sleepers can be a very cost-effective option. 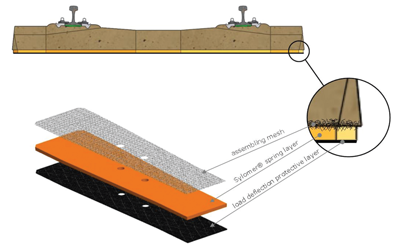 Accordingly, Under Sleeper Pads represent an economical alternative for retrofitting measures, helping to underpin investment in the tracks of the future. Eisenmann, J., Leykauf, G.: Zukunftsperspektiven zum Eisenbahnoberbau. EI Der Eisenbahningenieur (43) 3/1992, S. 130-139. Leykauf, G., Stahl, W.: Untersuchungen und Erfahrungen mit besohlten Schwellen. EI Der Eisenbahningenieur (55) 6/2004, S. 8-16.